Denise Wight - Biological Technician - Condor Country Consulting, Inc.
Denise Wight is an accomplished birder, and her expertise includes teaching others how to listen to and identify birds by the sounds they make, both vocal and non-vocal. She is familiar with all of the breeding birds of the San Francisco Bay Area, as well as those that winter in or migrate through the area. Ms. Wight has been a biological technician for CCCI since early 2012, where she has surveyed for nesting birds, and monitored Swainson's hawk nests and California burrowing owls at construction sites. Ms. Wight has led birding field trips since 1989, teaching general classes in birding since 1996, and birding by ear classes since 2006. She also leads Christmas Bird Counts and private classes, with the number of participant ranging from 3 to 37, for Mount Diablo, Golden Gate, Marin, and Solano Audubon Societies, the Lindsey Museum, Point Reyes and San Francisco Bay Bird Observatories, and local, community-based service clubs. Ms. Wight has given presentations on avian vocalizations and birding by ear to a variety of groups. 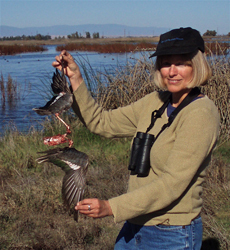 She participated in the Contra Costa County and Alameda County Breeding Bird Atlas surveys, and was acknowledged for reviewing parts of the Contra Costa Breeding Bird Atlas, and listed as a “local expert” in the Alameda County Breeding Bird Atlas.